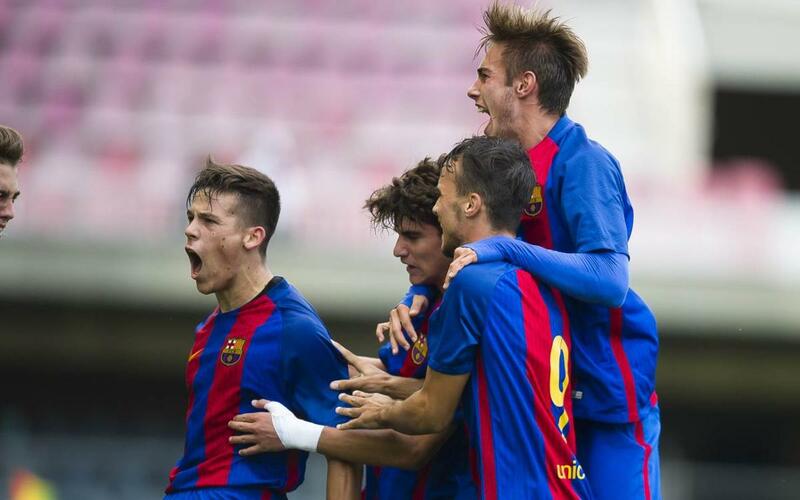 The FC Barcelona U19s are almost through to the last sixteen of the UEFA Youth League after a last-gasp victory over Manchester City at the Miniestadi. An intense but goal-less encounter was finally settled with just four minutes to go when Carles Pérez rifled home to leave his team with nine points out of nine and just one more win away from mathematical qualification. The 1,303 spectators were treated to a fine display from both sides, with Barça enjoying the bulk of the early chances. Abel Ruiz and Monchu both came especially close and Guillemenot even hit the post before City upped the ante, with Jadon Sancho and Paolo Fernandes making sure that Barça keeper Sergi Puig was kept busy. In the second half, Carles Pérez was especially active for the home side, but some of the composure went out of their game after Montes had been forced to withdraw injured. Brahim Díaz and Duhaney both very nearly made Barça pay, but the Catalans weathered that storm and gradually regained the control of the game. It looked like things were heading for a draw, but then Carles Pérez came forward to resolve things with an absolute humdinger of a left-footer that brought the Miniestadi to its feet. The win leaves Barça top of the group with nine points, while Man City have six and after their draw this afternoon, Celtic and Borussia Mönchengladbach are left well behind on a point each.